One of the neighborhood bakeries had a big sign showing newly released product - croissant made with Echire butter with a touch of fleur de sel. This top quality combo was too powerful that I just couldn't walked pass it without grabbing some home. Ate one and stored the rest of the croissants in the freezer. Surprising, the texture remained unchanged few days later after heating up in the oven. The already satisfying croissant turned into an even more fulfilling breakfast on one cozy morning. Heat up the croissants in the oven. Once ready, remove from heat and let the croissants cool down till ok to handle by hands. Slice the bread in half but leaving the very last end intact, meaning not fully slicing the bread all the way through. 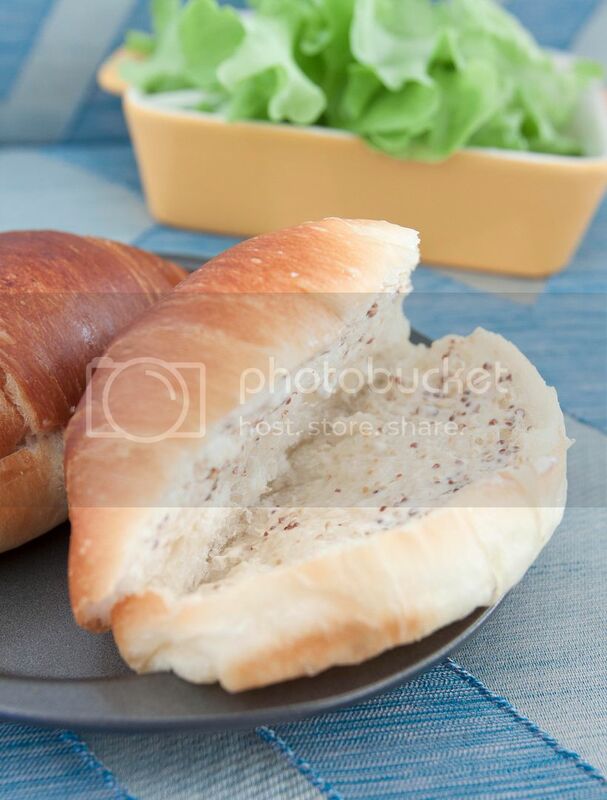 Carefully put the lettuce to the croissant sandwiches as the very top and bottom layers. 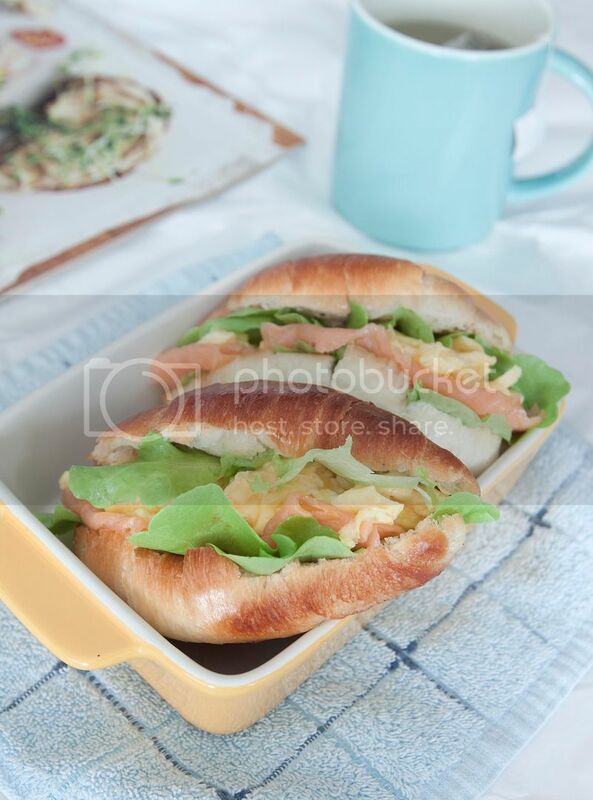 Add some smoked salmon in between the two lettuce layers. Beat up two eggs along with a small pinch of salt. Prepare a non-stick pan and turn to medium heat. Add the butter and wait till it melts, pour in the egg mixture and keep stirring gently to prevent the bottom and edges from browning too fast. In fact, try not to brown the eggs at all. Lower the heat a little if needed. Keep stirring the mixture till the eggs start to curdle, kind of like fresh cottage cheese. Quickly remove from heat when the eggs are still slightly runny. Keep in mind that the residual heat will continue to cook and harden the eggs. 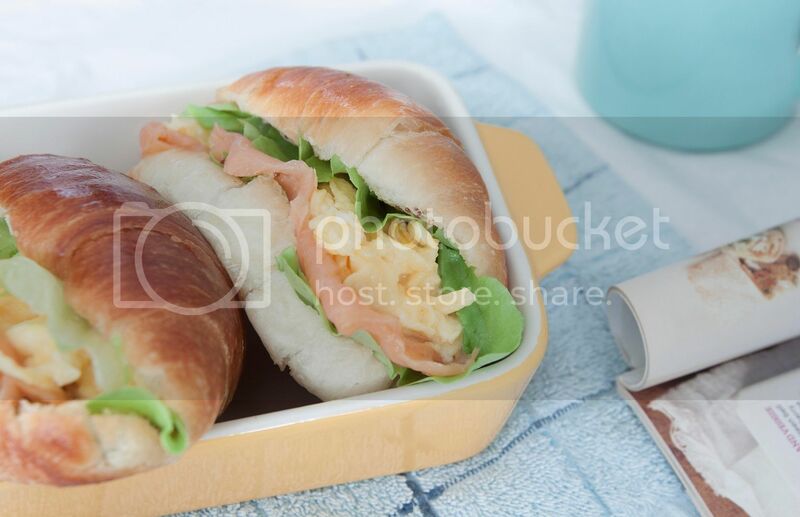 Transfer the eggs onto a plate or add directly to the sandwich on top of smoked salmon and below the lettuce. Leftover turkey or ham can be two other delicious alternatives. My house was filled with buttery and comforting aroma that morning. Simple pleasure.